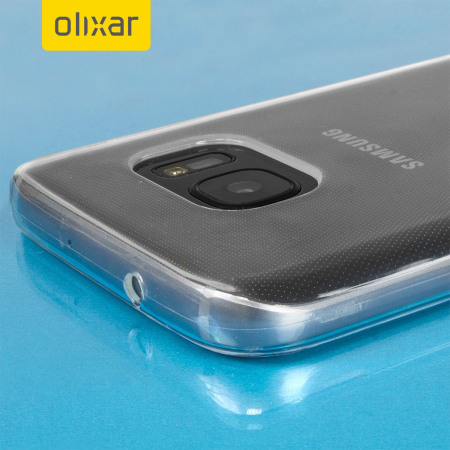 Custom moulded for the Samsung Galaxy S7, this clear FlexiShield case by Olixar provides slim fitting and durable protection against damage. Great product. clear but rubber/silicone feel which is nice to hold, easy to put on and off, feels more durable. winner! Mobile fun were great. Good comms. I had a package that never arrived and they immediately dispatched a second delivery. I think actual customer service shows when the unplanned happens. Anyway, product was good, and the comms in fixing a second delivery. The case is just as they state, but a bit more shiny than the photo. Good quality polymer. The "lip" to which they refer as being an added level of protection is very little and won't add much protection, but for a low cost skin it is fine. Fits properly, cut outs surround the phone's buttons nicely. I was impressed with the quick delivery and that description was good that i chose the right case for my phone and exactly like the one id had before. Brilliant quality item, looks great on my phone. goog fit to phone, not to bullky and looks ok. must cushion phone if dropped. Perfect fit,lovely clear sheen looks classy, would definatley buy again. The fit. The stealth it gives to your phone. Unobtrusive. Cheap. Whether it covered the front of the mobile too. This case fits well and is so easy to put on the phone. It looks smart, as if it were part of the phone itself, and will not (I hope) go brown in time as clear cases do. The power switch and volume buttons have covers over them and the cutouts allow plenty of room for the charger, earphones etc. Great item. Fits my Samsung Galaxy S7 perfectly! Wish I'd bought it before I dropped my phone! Really good quality and very affordable. The delivery time was spot on! This case was better quality than I expected (samsung cases often get the raw deal in cell-phone-case-world). LOVE it. Flexible, pretty, love the colour, flexible & protective layer. I needed a cover for my phone that would give protection but would not be obtrusive. This is perfect.Very easy to fit and does not restrict functionality. Not the cheapest available, but excellent quality. Excellent fit arrived on time very pleased with it. Clearly fit any charging socket cables and headphones in the bottom of the phone . I RECEIVED IT IN GOOD CONDITION. IT'S PERFACTLY FIT ON MY SAMSUNG GALAXY S7. QUALITY IS EXCELLENT. Every thing was there so no more addition. Fast delivery, good price and great product. It fits very well, and in my opinion makes the phone better to use as you can grip it easily. I work as a gardener and the case has proven easy to clean and has never got in the way. The only improvement I would make is that the hole over the earphone jack is tight for plug on my aux lead. Maybe it could do with being 0.5mm larger? Just what I wanted to protect my rose gold phone because why would you want to hide it! Great fit, great price what's not to like. Happy with purchase. This case is transparent and therefore does not hide the beauty of the case. The gel like substance gives the user a non slip grip. Very easy to install and well designed. Highly recommend. Well made product, good fit, and provides good protection for my S7. This is an excellent product as described and fits perfectly. I'm really pleased with this Flexishield. It fits the phone so neatly that you don't notice there's a case on it. It makes the phone less slippery so it feels more secure to hold and it protects the back from getting scratched. It wipes clean very easily. I Hope it will give some protection to the screen if the phone is dropped but I'm taking care to avoid testing this! Neat clear gel case that fits my S7 like a glove without covering up the smooth lines or colour of the phone. It gives an additional grip to the phone in the hand without any bulk. It should reduce any damage to the phone if dropped but I don't intend testing it! Great quality black case. Easy to put on. All very shiny whereas pic is matte but I like it as it's like the real phone underneath. Has good sized lip on front to protect it. Better than I expected! Increases confidence that the handset will not slip out of your hand. Does not increase the overall size excessively. Leaves all the connections and controls fully accessible. Fits well and doesn't 'wet' to the S7 glass back so it dosen't spoil the look of the phone. Can not fault it, fits perfectly & if anything enhances the look of the phone. Why have a lovely looking phone only to hide it away in an ugly case. Haven't put it to the test of how well it protects it ie l haven't dropped it yet but from the thickness of the case l am confident it will do the job. Its very reasonably priced but feels good quality. Very pleased. Plus it came very quickly & l used economy delivery,. 5 Stars for this case. Cheap but fits great. Ordered flexishield gel case for s7 at a great price, good quality product. This item fully met my expectations and complimented my phone. Great product. Bought the FlexiShield Samsung Galaxy S7 Gel Case - Black a couple of months ago and having used it for a while, I am very impressed with the quality. And it was cheap too! Essential protection for s7. Looks good and good price. Fits perfectly just what I wanted. Love the colour of my case,it fits perfectly and was inexpensive but good quality. Very happy with product,worth the wait. Phone cover does and looks like in description,fits well, looks good and inexpensive. I managed to do my new phone a couple of times before I bought this case but now it makes it less slippery & I can see the gold phone just as of it didn't have a case. Easy to attach unlike some other cases and easy to clean. Love it! This case fits the phone really well and offers excellent protection for the case. It's raised edge adds some screen protection too. The rubber gel case does not spoil the look of the phone and actually helps the grip. Without the case, it's easy for the slim, shiny, smooth phone to slip out of your hands. Great item i have purchased 3 of them for different members of my family. Super fit and looks good too 100% recommend. Nice quality soft gel case which feels good and has nice grip when you pick the phone up. First time for me to use gel case as I've always used flip-over cover and this gives me the confidence to hold with the nice feel to it. Gel cases for me from now on. Great price and very impressed with the speed it was delivered. Well worth it. Great just what I wanted needed a soft gel case as hard cases break to easly when dropped. Defently would recommend and fast delivery on time. An easy snug fit and looks good. So far so good. Really nice and elegant cover. Fits well and already proved it worth protecting my phone when it hit the ground. Very pleased with this, has raised lip around front edge which protects screen if placed face down and the thickness of the case protects the camera glass on the back. Nice and grippy round the sides. Good sized hole for headphones allows most plugs to fit, not just skinny ones. Ordered same case twice now from mobile fun. It's an excellent case and only ordered again as other one dirty after nearly a years service. Ordered other items from mobile fun when i had an LG phone also. Always good service and keep you well informed. Having never purchased a case for a phone before, I opted for a cheaper alternative to start with. The case is brillIant, it gives great grip, doesn't make the size of the phone much bigger and leaves me confident my phone is protected. Arrived within the advised period (standard delivery). Product looks great, onyx black and shiny, and feels grippy yet smooth in the hand. Fits perfectly to the S7 dimensions. Price is ridiculous value though I haven't dropped the phone yet and not going to try! I recommend this product. Very good fit. Clear case shows up the lovely gold colour ofq my phone. Provides a little lip around the edge of the phone. Don't know how much protection it gives if phone is dropped but I do think the soft gel case is better than the rigid cases you can get. Would definitely recommend & it is a very good price. Would buy again. perfect fit exacly what I required in a phone cover. Ecellent product fits phone perfectly. Phone much easier to hold and reduces the sensitivity of the buttons so I don't press them all the time by accident but they still work perfectly. Brought a black case for my boyfriend as he had just upgraded his s5 to a s7 and he always drops his phone. Boyfriend is a cab driver and drops his phone without fail every morning whilst getting out of his cab with a handful of electronics (sat nav, taxi PDA, phone). This cover has saved his phone numerous times in the last two weeks. Cover offers great protection, looks good and doesn't make your phone look bulky like other covers do. Highly recommended!! This case is a very good silicon case. it grabs very good the phone and is clear. you can view the color of your phone. This gel case I got fits like a glove & gives the phone a better grip. Fits my phone really well. Good value. Delivery prompt and was well packaged. Perfect fit, all the holes in the right place. You hardly know it's on the phone, light and thin but still substantial enough to be useful. Already dropped the phone once - no damage. Does it look OK on the phone? Yes. Hesitate not, this is money's worth. Ordered two, they fit the phones and look relatively nice (they're clear). They also have a warranty (yay) so if I drop my phone and the screen gets tragically smashed, at least I can replace the case that was meant to give it some protection. Easy to fit, lightweight and snug. Provides really efficient and cost effective protection for the phone! Easy to put on and remove. Very durable and 'grippy'. Has a lip that goes around the screen. I just didn't realise that it is transparent. Love this case so far! Allows easy access to all buttons and jacks and material allows for good grip of the phone. Not bulky at all. This case fits perfectly. It is a soft plastic so is easy to get on and off. It also stops the phone from slipping out of your hand. I have a black phone and opted for a purple case which gives is a subtle hint of colour. Fantastic value for money and fast delivery too. Really nice gloss black and sleekest slim case I've found. Easy to remove if you feel like changing the case for the different occasion. Not sure if will take the fall for an urban outdoor but adds no extra weight or bulk which is what I was after! Great item! Quick reliable service, excellent product. Very nice product. Fit the phone perfectly and clean clear showcasing the beauty of my phone. Just what I wanted. A jelly case that fitted and helped me hold the phone securely. Nothing more than was already on the advert. Took a while to come in from backorder however, once it was in it shipped very fast from the UK to the US. The case fits perfectly on my Galaxy S7 and I love the color. The fit and finish of this case is excellent . I would not hesitate to order from mobilefun.com any olixar products. The case is excellent. Looks good, fits perfectly and a great price. Postage was slow (2 weeks) to get from Melb to Syd. I would expect 3-4 days max. Otherwise Im very happy with it. This see through cover for my S7 it just what I was looking for. It allows me to see the super slick gold casing of the mobile. Being see through means I can also print off the logo of my favourite team.and slip it into the back of of the casing for all to see. If i change my mind it's easy to print another logo and put it in without any hassles. This item was was delivered quickly, it was easy to fit, and doesnt impied the use of the phone. If you have a coloured phone it doesnt hide the colour.All in all a good buy. Great case, shame it's not a little thinner, like skin tight! The flexishield case is clear , gel like material is virtually scratch proof and very grippy. It fits perfectly and is far superior to the Otter box I purchased originally for the s7 . Buy it you won't regret it . Better than the $40 Samsung hard case I had. Minimalist. Sufficient grip that it doesn't slip out of your hand (unlike Samsung shiny plastic case) but I would like it to have a textured back which it doesn't. I haven't dropped it yet but it looks like it offers good protection. Use it with a tempered glass front panel. Good quality gel case fits perfectly to the phone, good tight fit. Decent thickness without making the phone feel bigger. Provides good protection. Not as cheap as those on offer elsewhere but far superior. Recommended. The clear case doesn't detract from the gorgeous looks of my S7 and how a phone looks is one of the key reasons for buying it in he first place. I don't know how well it would protect the phone if I dropped it (and I'm not planning on testing that), but it can only help. The case feels good in the hand and not as slippy as the phone without the case. I keep my phone in my breast pocket from which previous phones have dropped out too many times, so for now I also keep the S7 in an oversized slip case when not in use. I wish I could find a case which secured the phone in my pocket (as my slip case does) but which didn't detract from the phone's 'beauty' as is the case for the FlexiShield Samsung Galaxy S7 Gel Case.